Sorry for not writing for a while – I have been a little preoccupied with a few things. ‘Hey, you used to write wonderful, but the last several posts have been kinda boring. I miss your great writings. Past few posts are just a little out of track! Come on!’. While no-one (I am assuming, of course) likes negative feedback, I can understand where the reader is coming from. There has been a shift in my writing recently. I have been focusing more on factual information and less on personal observations. It was a conscious decision to make the shift, but not necessarily a voluntary one. Given the reader’s comment, I am going to try to inject my personality back into my posts. With a sort of an explanation of my recent change in posting style, let me get back to the content of my proposed post. I chose the title of this blog for a couple of reason. Firstly, and following on from my post ‘when life gives you lemons’, I feel that life has thrown me a few lemons and limes recently, but rather than focusing on the negative, I wanted to turn my metaphorical and literal lemons and limes onto something more positive. Secondly, I recently did some baking with limes and thought it would be a good idea to write about this bake and link it back to another metaphor. As you will remember, I have been trying out a number of vegan bakes of late. The last time I wrote about them was in my Valentine post. Since the Valentine post, I have only experimented with one more vegan bake, as well as had a lot of practice with vegan cookies as I now provide one of my customers with a batch of chocolate and a batch of macadamia and white chocolate vegan cookies on a weekly basis. A while back, I bought myself an Excalibur dehydrator with the intention of dehydrating a range of fruits to decorate my cakes. For a long time after my purchase, my dehydrator lay dejected, gathering dust. Sad for my dejected dehydrator and being reminded of how much my dehydrator cost me, I felt that it was high time that I brought my dehydrator out of hiding and dehydrated a bit of fruit. Having dehydrated various fruits (lemons, apples, oranges etc.) on my Diploma in Professional Patisserie, I religiously followed my Ashburton Cookery School recipe for dehydrated fruit – a recipe which involved simmering sliced lemons and limes in a stock syrup until translucent and then dehydrating them in the dehydrator until dry. Although I say that I followed the Ashburton Cookery School recipe religiously, this is not exactly correct as I think I inadvertently simmered my fruit in the stock syrup for too long so the fruit was less intact than it should have been. The lemons and limes are supposed to be simmered until the pith becomes translucent. Let’s just say that the piths were ‘stubborn little suckers’ and did not want to transform themselves from opaque to translucent. As a result, and as I mentioned already, the end result was that my limes and lemons were less intact than they should have been. That being said, the limes fared better than the lemons. Although not the perfect, I posted a photo of my dehydrated limes on my Instagram account, @bakebybuffy in which I tagged @excaliburdehydrator. Their response was ‘Hopefully you’ll share the final product. Dehydrated citrus + Baked Goods = . My response was that ‘I will definitely post when I make the final product’. 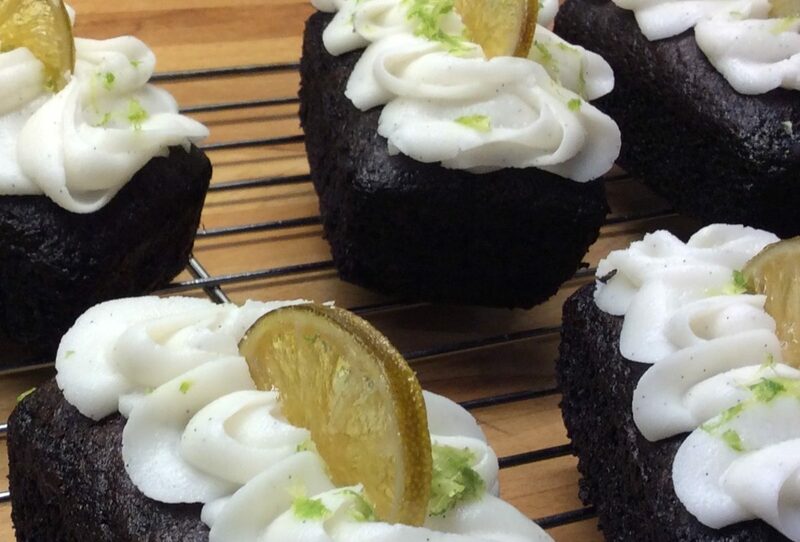 With this promise, I needed to find a bake that I could decorated with dehydrated limes. Having been inspired with my Valentine bake of a vegan chocolate and raspberry cake, I thought that I could play around with the recipe a bit and make a vegan chocolate and lime cake. It wasn’t exactly rocket science. Instead of raspberries in the icing, I added lemon juice and adjusted the other icing ingredients accordingly. I also added some lime zest into the chocolate cake for some extra zing. Most importantly however, I finished decorating the cakes with a bit of fresh lime zest and a dehydrated lime. I was quite pleased with the final look, even if I say so myself. I tried the cake myself and gave one to my chief taste-tester, Jo (my husband). I also gave a couple to my vegan/vegetarian neighbours. By all accounts the end result was a successful bake. Having promised to share a photo of the final product, I posted my chocolate and lime cakes on Instagram, tagging @excaliburdehydrator. Their response was ‘Wow! These look incredible!’. Happy with the overall result and positive comments about my bake, the title of my post seems quite apt: ‘when life gives you limes rearrange the letters until they say smile or better still, bake them into a chocolate cake and share them with family and friends.